The jobs market is well into the 21st century. So why isn’t our education system? Today’s jobs are vastly different than they were a generation ago. All of us, from Gen Zers to Boomers, are facing a working world that is more changeable and unpredictable than ever. The days of working for 40 years at one job and retiring with a good pension are gone. Now the average time in a single job is 4.2 years , according to the US. Bureau of Labor Statistics. What’s more, 35% of the skills that workers need — regardless of industry — will have changed by 2020. That rapid pace of change in jobs and skills means there’s a growing demand to update skills as well. According to a new report on workforce re-skilling by the World Economic Forum, one in four adults reported a mismatch between the skills they have and the skills they need for their current job. Here’s the problem in a nutshell: the job opportunities that are available today are 21st-century jobs. 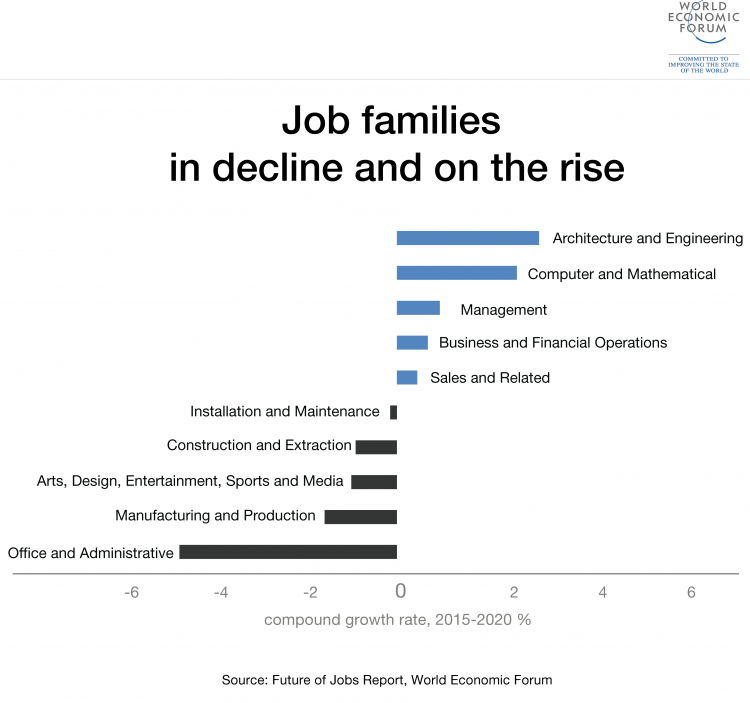 But the way most people perform these jobs is still stuck in the previous century. As is the way our society is training and educating people. In the 19th century, there was a massive movement of the population from rural to urban centres. The primary and secondary education system was created to train the workforce for the “new” world of manual and clerical work in cities. In the 20th century, work was dominated by factory jobs. The education system that was built in the previous century was, with some modifications, still suited to training good factory workers and their managers. Management focused on a series of tools to optimize this kind of work: operational efficiency, something called Taylorism , and eventually some management philosophies called Six Sigma . Management was mostly done face to face, while health insurance, a social safety net, and other benefits were bundled into inflexible labour contracts. Today, in the 21st century, we’re seeing the rise of new work models such as freelancing and remote work. In the most advanced companies, teams are learning to be more agile, to work with distributed and remote teams, and to scale up and down to adapt to ever-changing conditions. This is the future of work. Yet education hasn’t kept pace. We still send our children through a fixed set of primary and secondary education steps, only now a college degree has been added on as a virtual prerequisite for the best jobs. The model doesn’t actually prepare anyone well for a flexible world, in which skills are typically outdated by the time you finish a four-year degree. Further, on-the-job training isn’t enough to close the gap. The World Economic Forum report found that 63% of workers in the US say they’ve participated in job-related training in the past 12 months. Yet employers are reporting the highest talent shortages since 2007. Given this situation, people in the workforce should proactively steer their own ongoing skills development. In other words, recognize that you need ongoing training, and realize that you hold the responsibility for your own education. Do that, and you can improve your marketability for years to come. The first step is to ask yourself: Are my skills still in demand? What’s the outlook for these skills? And what skills could I work on today that would increase my income potential in the coming years? Do this exercise every few years. If the half-life of a job skill is about five years (meaning that every five years, that skill is about half as valuable as it was before), you want to get ahead of that decline in value. Assess your own skills every two or three years, and get started learning new skills sooner rather than later. For example, if you are a truck driver, you can see that autonomous vehicles are a likely threat to your employment — maybe not this year or next year, but certainly within five or 10 years. Don’t wait until self-driving trucks are a common sight on the highways to start building skills for your next job. Start doing it this year, so you will be ready when the time comes. Don’t feel like you have to retrain yourself completely, all at once. First of all, as pointed out by the New York Times this week, many of the skills needed to do fading jobs are applicable to growing jobs . For skills you do need to acquire, consider step changes. In computer science, we are trained to break down large problems into smaller chunks that can be more easily solved, one at a time. You’re not going to turn yourself from a coal miner into a data miner overnight. But you can acquire basic skills leading in the direction you want to go. As your career progresses, make decisions about which work to take based on how much you will learn. Prioritize jobs where you will learn valuable new skills. We cannot put all the responsibility on individuals. Companies and governments have a moral obligation to educate workers better than they do now. Companies should offer more flexible training for all their workers, both staff and freelance. At many companies, management is reluctant to do this. What if we raise the skill levels of our people and then they just leave for a competitor, they ask? The rejoinder is simple: What if you don’t, and they stay? Companies need to look beyond the “not my problem” mentality when it comes to skills acquisition. If nobody takes responsibility for training, simply assuming that some other party (another company, universities, the government) will take care of it, then we have a classic tragedy of the commons. Instead, we all need to contribute to investing in workers’ skills. To facilitate this kind of cooperation, there is a big role for public-private partnerships, such as internship and apprenticeship programmes, and vocational training that prepares young people for jobs that don’t necessarily require a college degree, but for which industries have specific skills needs. This model has produced great success in other countries, such as Germany and Switzerland. Both of these countries have demonstrated strong outcomes in procuring adult technical skills and their models could be expanded to other countries. Meanwhile, for individuals, don’t wait. Take charge of your own future now, and start working on acquiring the skills you will need to have five years from now. Whether you are a truck driver or a data scientist, one thing is certain: job security lies in acquiring new skills throughout your entire career. You can view the full World Economic Forum report, Accelerating Workforce Reskilling for the Fourth Industrial Revolution , here.